Hello, my name is Tabatha and I’m addicted to making Michelle Patterns bags. I’m starting another, this one is the Sweetheart Shopper, a semi-retired yet adorable mid sized bag. I wish I could use more denim and Ruby by Bonnie and Camille but I’m all out of that floral print (make a note Amy, I’ll be coming to you for more!!). I think I’m going to use a natural linen with more embellishments and details. Earlier in April I purchased a Spring bundle and a scrap bag on sale at Fig Tree & Co. and completely forgot about it. This is a line and designer I’ve never tried before. “Gentle” is not a word I’d use for myself, I’m too clumsy for that and typically prefer primary and secondary colours over pastels. 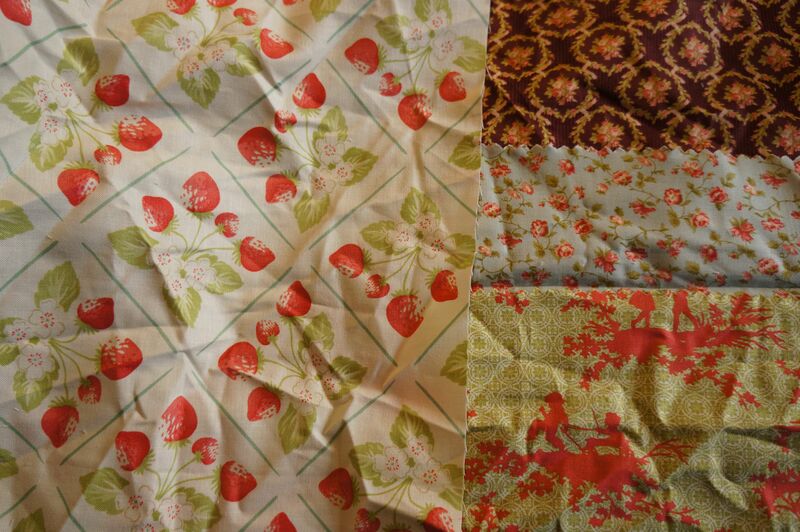 This fabric however, is gentle and sweet with a vintage feel. I think it’ll be perfect for some Zakka style projects. The scraps that were stuffed into a plastic bag were astounding. Lovely huge pieces and plenty of them! 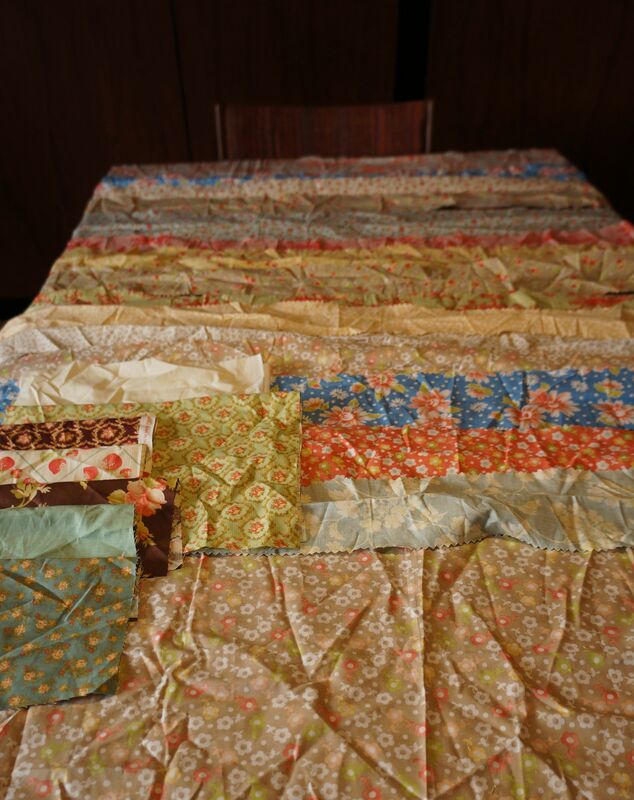 I believe I could actually make a baby quilt with all these scraps! This is a great way to sample fabric, I wish more designers would offer this option because as a result of being able to see and touch these scraps in person, I’m going to order a few of these prints in yardage. One of the prints I find really interesting is the silhouette of children playing on a patterned background. I love the little rose prints and those strawberries could be fussy cut for many different projects. 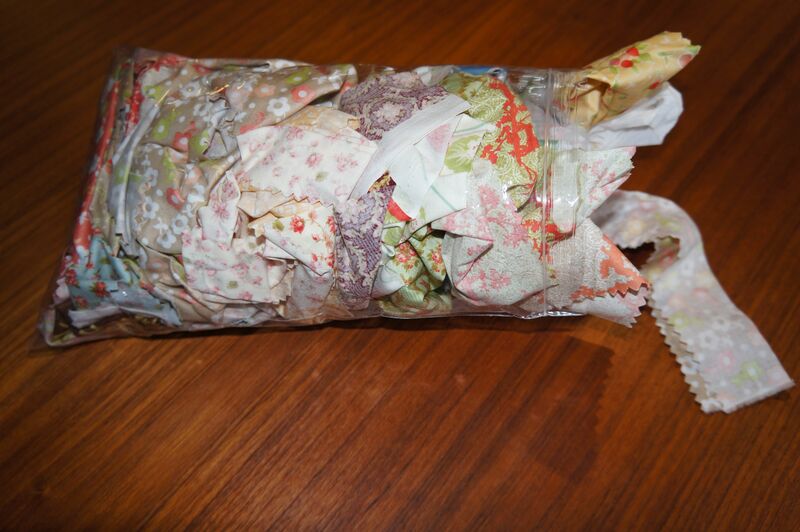 There were so many scraps in this bag that they managed to cover my entire dining room table!! Nine more days till our flight leaves, 8 working days! This entry was posted in Fabric, Keyka Lou by Tabatha. Bookmark the permalink. I am addicted to making Michelle pattern bags too! I have a sweetheart shopped all cut out and waiting for a spare evening! This will be my first one and I’m toying around with what kind of interfacing or something to use to make the bag have a little more structure. I love buying scrap bags! Like a moth to the flame when it comes to them.